Custom Sheet Metal Inc. services Littleton, Colorado and the surrounding areas. We provide custom sheet metal, metal fabrication, custom flashings, custom gutters, break metal, custom metal panels, and custom metal colors. Custom Sheet Metal Inc. is a family owned business. 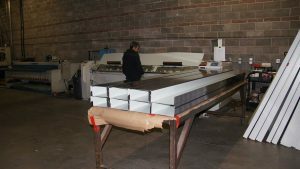 We are focused on providing outstanding customer service and satisfaction with our custom sheet metal products. We have built our business on our outstanding reputation and referrals from our customers. What areas do we service outside of Aurora? We work with Steel 26,24,22 Gauge, Aluminum and copper. Custom Sheet Metal Inc. ‘raises the roof’ with affordable, professional metal installation services.